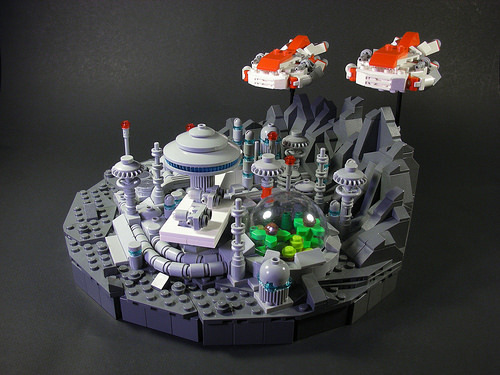 Tim Clark just posted this fantastically complex microscale space scene, complete with a pair of ships flying overhead and two more smaller ones on a landing pad. 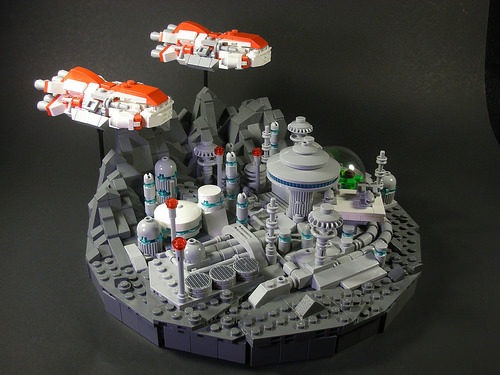 This build is a great example of how repetition can really increase the realism of a LEGO model — the pairs of ships, the beacons, and all the small technical details. Real life is full of repetition, and doing the same even in a sci-fi setting adds a level of realism that would be lacking if every detail was unique. Here’s another great shot, showcasing the landing pad and the biodome behind it.